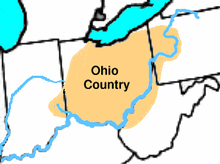 The Ohio Company, formally known as the Ohio Company of Virginia, was a land speculation company organized for the settlement by Virginians of the Ohio Country (approximately the present state of Ohio) and to trade with the Native Americans. The Company had a land grant from Britain and a treaty with Indians, but France also claimed the area, and the conflict helped provoke the outbreak of the French and Indian War. In fact, land speculation goes back to the Mayflower and beyond to the Spanish conquistadores. Much of the settlement of the western part of what is now the United States, occurred as a result of various land sales and promotions usually referred to collectively as the Homestead Acts. This is how my great-grandfather, Henry Martin Tanner, obtained some of his land in Northern Arizona. 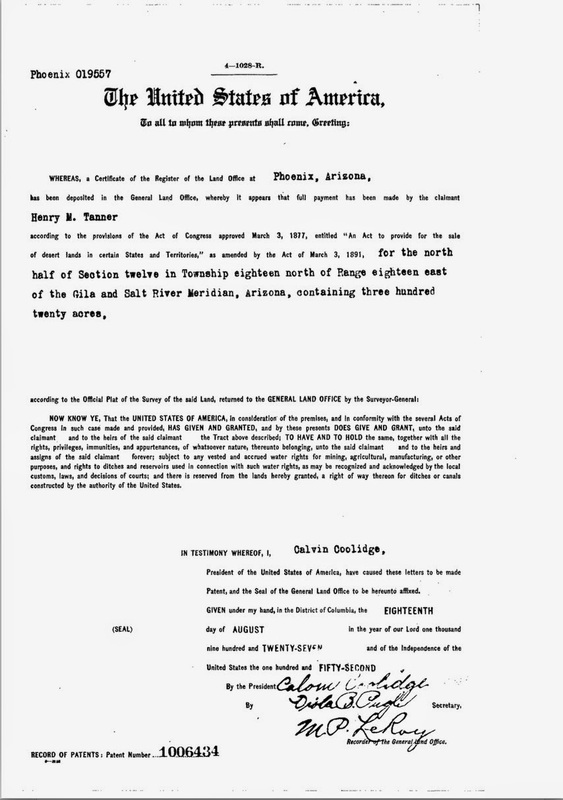 Here is a copy of the Land Patent issued to him for 320 acres in 1927. You might note that the Land Patent was signed by President Calvin Coolidge. Understanding the way land was acquired and owned is another one of the vital components to advancing your genealogical research. Land records are usually available and in most instances, if destroyed, they are almost immediately reconstituted. This series is directed at the issue of land ownership and the documents supporting such ownership. Land records exist from the first permanent settlements in America. In Massachusetts, "the earliest known deeds were recorded shortly after the arrival of the Pilgrims at Plymouth in 1620." Land records are among the best-preserved, largest, and most comprehensive genealogical record groups in the United States. Because land was inexpensive and readily available, 90% of adult free males were landowners before 1850. Many of the genealogical knots we encounter in early american history can be untangled by examining the land records. LifeStory and Family History Expos Have Teamed Up! We have worked with LifeStory for many years. They are exhibitors at many of our Expos and Retreats. We love their Heritage Collector System. If you do not already own “The Heritage Collector System” today is the day to download and try the Free Standard Version. Marlo and Holly have been working together for years with webinars, classes, and training that assists family history enthusiasts to share the results of the research with family and friends, especially youth! Sharing it in a fun, organized, and colorful way that entertains and educates those with whom you are sharing. 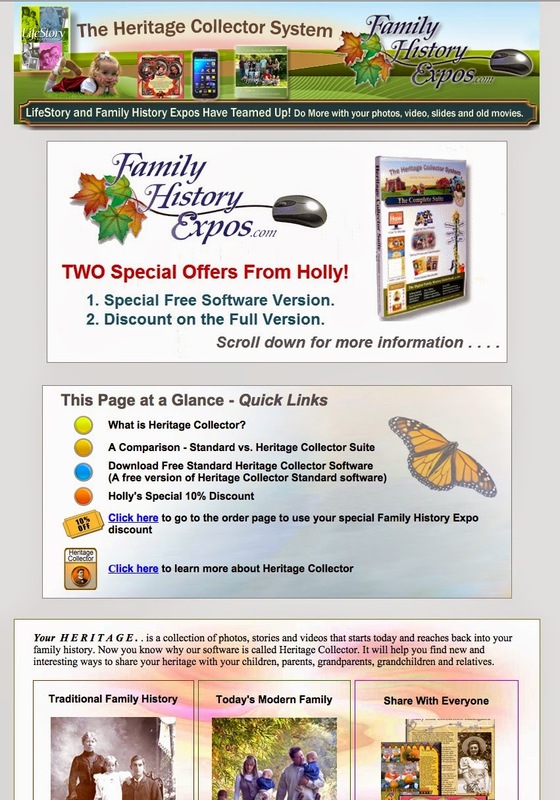 Today, The Standard Heritage Collector, is available only through Family History Expos. This is a unique offer we have worked years to bring to you. You will have fun making and sharing personalized slide shows, storybook pages, calendars, GPS maps and more. 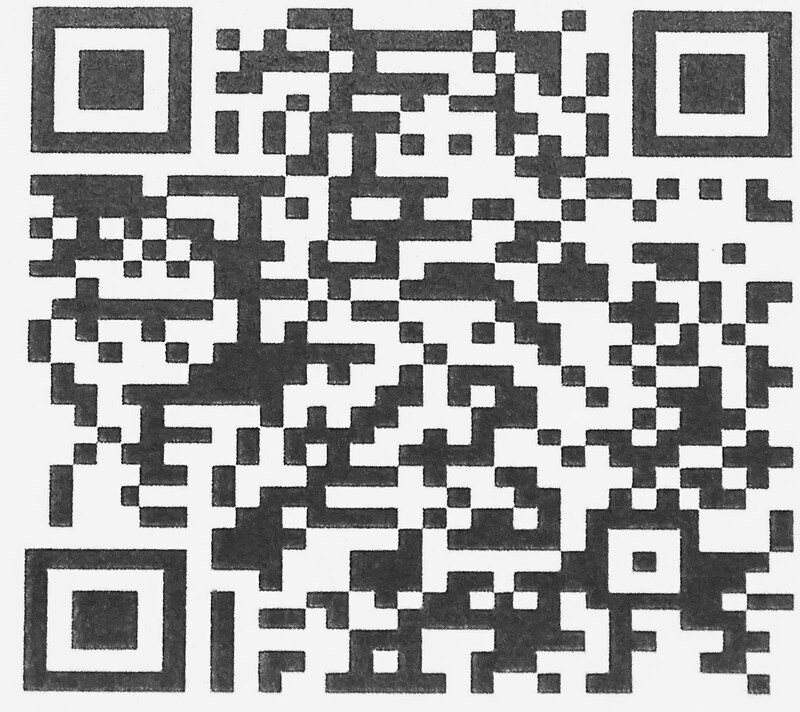 You can use your smart phone, tablet, camera, scanner and external hard drives. Access “How To” movies, step-by-step instructions and newsletters that provide new ideas and help you need to successfully complete your projects. Download your free version today and join us for an upcoming webinar designed to assist you with all the program features that help you organize, find, share, and preserve your photos and other information in a graphical context. Your H E R I T A G E . . is a collection of photos, stories and videos that starts today and reaches back into your family history. Now you know why our software is called Heritage Collector. It will help you find new and interesting ways to share your heritage with your children, parents, grandparents, grandchildren and relatives. Holly's Special is 10% Discount on anything you order from LifeStory Productions Inc., the makers of Heritage Collector Standard. This is a limited time discount! FamilyHistoryExpos has been conducting Expos across the United States for over ten years. Recently, the company has focused on Research Retreats, smaller organized groups who undergo a few days to a week of intense research training. To see the list of the upcoming Research Retreats, see Expos. New RootsMagic 7 COMPARE FILES Feature - My Way! Today I read a very interesting commentary by Louis Kessler who speaks from a developer's standpoint. His post on Behold Genealogy is entitled, "Genealogy Software is Transforming." I can say that I have observed some of the same attitudes from the large online genealogy companies that are the subject of his commentary. I would take this a little further however. I would refer to a link Louis gives to his previous post entitled, "My Analysis of RootsTech 2014." I would also refer to my own article, written earlier this year and linked by Louis, entitled, "MyHeritage -- The Vision to Become the Leading Genealogy Company #RootsTech 2014." I would point out, however, that comparing FamilySearch.org, a non-profit corporation, with the other commercial genealogy companies, would seem to always put FamilySearch in an unfavorable light. The fact is that FamilySearch.org has an entirely different motivation and dramatically different goals than do the other large genealogical data suppliers. FamilySearch's major contribution is the accumulation of so many records from around the world. This core of records is now being made available to the other large genealogy companies, including, of course, MyHeritage.com. This basic difference in FamilySearch's objectives, which have a decidedly religious motivation, could easily be interpreted by developers, as Louis expressed it, as a "ho-hum" attitude towards adding partner programs. The agreement between RootsMagic.com and MyHeritage.com seems to create an obvious advantage for each. That sort of advantage is not the primary motivation of FamilySearch, therefore the reaction of FamilySearch to a commercially oriented business proposal cannot be viewed in the same light as the other companies' reactions. At the core of this entire issue is the need for genealogists to provide adequate and, where warranted, extensive and even exhaustive source information concerning their research. The time for compiling lists of names, dates and perhaps places is now past. We can think about the history of genealogy and its rather rocky beginnings, but we are most certainly in a time of transformation. Genealogy is rapidly evolving into something entirely different. Whose vision of the future of genealogy will prevail? My best guess is a blend of FamilySearch and Gilad Japeth's MyHeritage.com. We will all be the beneficiaries of these advancements. In no way do I wish to denigrate the contributions of the many other genealogy companies. We are witnessing unprecedented advances from many other companies, but I am merely being consistent with my views expressed earlier this year. Probate is a set of court or government procedures established for the orderly transfer of property from a deceased person to his or her heirs and/or assigns. Records kept in the course of a probate action are valuable sources for information for genealogists about the deceased and the deceased's family. As an editorial comment, unfortunately in recent years, probate has become overlaid with so-called "estate planning" which, for all but the very rich, is an excuse for selling either an insurance product or associated services. Since the most ancient times, the motivation for some kind of court or government involvement has been the issue of taxes or other restrictions imposed on the transfer of property occurring at the time of death. At each stage of the probate process, there are records made of the proceedings that have become extremely valuable to genealogical researchers. However, there is a basic limitation to probate: no property, no probate. In addition, probate deals with the concept of individual ownership or rights to property both real and personal so the concept of probate evolves as property laws evolve. In more modern times, this involvement of property laws with probate, tax laws with probate and court procedures with probate all create a huge challenge for genealogists. There is no need for a genealogist to become a legal practitioner, but the jargon and the concepts involved in probate, property law and court procedures are important adjuncts to understanding these areas of research. I remember that one of the major challenges of becoming an attorney was the obstacle of not knowing or understanding the terminology. The simple solution is to use the Internet or a good legal dictionary to look up every word you do not fully understand. If you are like me, you will also have to look up most of the words in the definitions for a while until they become familiar. Therefore the initial challenge for the researcher is learning the probate, property law and court jargon. The first and most important term is the idea of an "estate." In order to have an "estate" the law, at the time, must recognize individual property rights and the ability to alienate or transfer those rights to a spouse or other family members collectively called the deceased person's heirs. For a much more extensive discussion of this topic see Wikipedia: Legal history of wills. The estate is considered to be the residual property previously owned by the deceased person. Therefore, the "estate" is an abstract concept that evolved to account for the rights in property that were preserved after death. As a result of the differences in property law from country to country, the laws governing the transfer of property upon death reflect those differences and each country has its own brand of law. These types of differences have continued to recent times and, for example, each state in the United States has probate laws that differ from every other state; what would seem to be minor differences in probate laws can have a considerable effect on the disposition of property. As individual property rights were recognized from ancient times, the idea of a "will" developed contemporaneously. The will was a document created by a person before death that attempted to influence the distribution of that person's property after death. Of course, there had to be some congruence between the desires of the person contemplating death and what the law would allow at the time the person died and again, since ancient times, governments of all kinds have imposed formal restrictions on the making of a will. Most commonly, the restrictions require that a will be created with some level of formality and in many instances had to be either written and witnessed or, if made orally, had to be written down at the time or shortly thereafter. This is a boon to genealogists because many of those documents were and are preserved. When I say that a will is a an attempt to dispose of property, I mean that the heirs may or may not observe or comply with the provisions of the will. In addition, the government may declare all or portions of the will unenforceable for a variety of reasons. It is the interplay between the desires of the deceased and the government and heirs that turns probate into the huge resource for research. In many cases, genealogists profit from the arguments and fights between the heirs' interests and the governments' interests. Because of probate's very nature, it has proved to be highly conservative. The forms and language of probate has persisted over the centuries. Modern attempts to reform probate language have usually only resulted in other terms being substituted for the more archaic terms. At the same time, as property laws change, there has also been a concomitant change in probate terminology. This is an ongoing series in which I will discuss many of the aspects of probate law. Stay tuned. Very frequently I am asked if I am related to someone who has the same surname. Although Tanner has gained great popularity in the last few years as a given name, it is a relatively less common surname. Most genealogical researchers tend to focus on an ancestor's name rather than location or other historical details. This limited focus often brings a great deal of frustration and ends up with the so-called "brick wall" situation. Understanding some basic facts about names and naming patterns is a prerequisite to doing effective research. Since, outside of science fiction, a person can only be in one place at one time, researchers should actually be focusing more on where events occurred than the particular form of the names of the ancestors involved. This is not to say that names should be disregarded, it is just more important to associate an individual with a particular location than it is a particular name. In a sense, this approach is similar to what has been done by many genealogists in the past and is still being done presently. When a researcher encounters a situation where the records are sparse, particularly in a small area, they sometimes focus on the surname and simply "extract" all of the people in the location with the same surname. This is sort of a shotgun approach to genealogy. The supposition is that by extracting all of the people of the same name, the researcher will inevitably have located the ancestor. When I have encountered this type of research, I usually find that when the decision has been made to extract names, the research quits trying to differentiate the people with the same or similar surname into family groups and considers each as a separate individual. My earliest encounter with this type of research was when I was reviewing and recording a great deal of genealogical research records obtained from one of my great-grandmothers. She had a tendency to research a particular line, but if she could not find specific records about the individuals, she would just copy out anyone in a particular parish or other area with the same surname. This activity of name-gathering was very confusing for me for a considerable period of time since I could not figure out how these people in her files were related. The simple answer was that they were not related through blood lines. As I did more research on my own surname line, I found that the genealogy was pretty simple. The line went back to an early Rhode Island immigrant named William Tanner and stopped. Despite claims by some, no has yet demonstrated with documentation a connection to England where this particular ancestor probably originated. As I continued doing genealogical research over the years, I encountered a lot of different "Tanner families" who were not related. One time, in the Hancock County Historical Society in Carthage, Illinois, I found a card catalog with the listing of a perhaps hundreds of Tanners, all who came from Switzerland. These and many other experiences have led me to the conclusion that searching for surnames is really somewhat antithetical to the pursuit of ancestry i.e. genealogy. They are two completely different goals. Although, there is some argument for the extraction method, if the researcher is willing to spend the time differentiating each of the individuals with the common surname and separating them into family units and then further identifying the unit that is the ancestral family of the researcher. I have absolutely nothing against people who wish to pursue one-name studies. I have found, however, that the more the name, the less help the one-name study is in assisting genealogists and, of course, I identify myself as a genealogist. One of the most common mistakes made by people interested in genealogy, but without any background or experience, is that people with the same name are related. I get this when people ask about a relationship by saying, "are you related to Bob Tanner in Nephi, Utah" or something like that. Because of my extensive family in the western part of the United States, this question usually elicits the same answer; if that person is a member of The Church of Jesus Christ of Latter-day Saints, then the answer is probably yes. More knowledgeable individuals, who are somewhat aware of genealogy, usually ask the question differently; they say "what Tanner family are you from?" I even have one uncle who married late in life and all of his wife's adult children who had the surname of his wife's first husband, for a lot of reasons, decided to become "Tanners" and changed their names. The more you become familiar with the limitations of focusing more on names than on places and other factors, the more you are likely to be successful in pursuing your own ancestry. But that is another topic for another time. From my perspective, the amount of information available online and in libraries and other collections around the world is essentially limitless. I regularly discover vast new collections which were previously unknown to me. The trick is remembering that all these resources are actually there and making use of their contents. You might wonder why I monitor a publication such as The Jewish Daily Forward. It is exactly for this reason. I see this publication and other similar ones, as windows into the rich resources just waiting for my exploration. Some people spend their time looking for gold, I find gold almost every day in the riches online. RootsMagic, first released in 2003, is an award winning genealogy program for documenting and preserving family history. Its latest version 7, released this week, includes among its highlights a new feature named WebHints powered by MyHeritage matching technologies that transforms the program into a powerful research tool. WebHints also include hints from genealogy website FamilySearch for authenticated users. Information sent by RootsMagic to MyHeritage for matching is never collected or shared, and is deleted after matching to ensure the complete privacy of RootsMagic users and their data. I guess I will have an answer this week when someone asks me what's new. TEL AVIV, Israel & SPRINGVILLE, Utah – November 25, 2014: MyHeritage, the popular family history network, and RootsMagic, Inc., today jointly announced that MyHeritage’s Smart Matching™ and Record Matching technologies have been integrated into RootsMagic’s latest version of its popular genealogy software. This enables RootsMagic users to discover the life stories of their ancestors thanks to highly accurate matching between their family trees and millions of family trees and billions of global historical records available on MyHeritage. MyHeritage enables millions of families around the world to discover, share and preserve their family history on the MyHeritage website, mobile apps and desktop applications. In addition, MyHeritage is well known as a technology innovator. Its flagship technologies, Smart Matching™ and Record Matching, which generate automatic discoveries based on MyHeritage’s huge international database of family trees and historical records, are sought after within the family history space. Leading genealogy organizations are partnering with MyHeritage to integrate these technologies into their products. For over 20 years, RootsMagic, Inc. has been creating computer software with a special purpose - to unite families. One of its earliest products, the popular Family Origins software, introduced thousands of people to the joy and excitement of family history. That tradition continues today with RootsMagic, its award-winning genealogy software which makes researching, organizing, and sharing family history fun and easy. TEL AVIV, Israel & SPRINGVILLE, Utah--(BUSINESS WIRE)--MyHeritage, the popular family history network, and RootsMagic, Inc., today jointly announced that MyHeritage’s Smart Matching™ and Record Matching technologies have been integrated into RootsMagic’s latest version of its popular genealogy software. This enables RootsMagic users to discover the life stories of their ancestors thanks to highly accurate matching between their family trees and millions of family trees and billions of global historical records available on MyHeritage. This is fabulous news for those users of FamilySearch.org's Family Tree because RootsMagic.com has a synchronization function that allows RootsMagic users to move sources into the Family Tree program. Now users of both RootsMagic and Family Tree have a potential pathway to moving sources from MyHeritage to Family Tree. I hope this works. This announcement follows other integrations of MyHeritage matching technologies by British genealogy software, Family Historian and Dutch genealogy services Aldfaer and Coret Genealogie. Available on MyHeritage and through a wide set of partnerships, MyHeritage matching technologies have become the de facto standard for automatic discoveries for everyone interested in their family history. I caught the Dutch connection, but missed the British one. One of the things I have been writing about for the past year or so is the need for the genealogy software companies to be associated with a large online database. The revolution in genealogy is the automation of the search process by companies following MyHeritage.com's lead. The survival of the independent genealogical database companies will hinge on their ability to integrate this new technology. 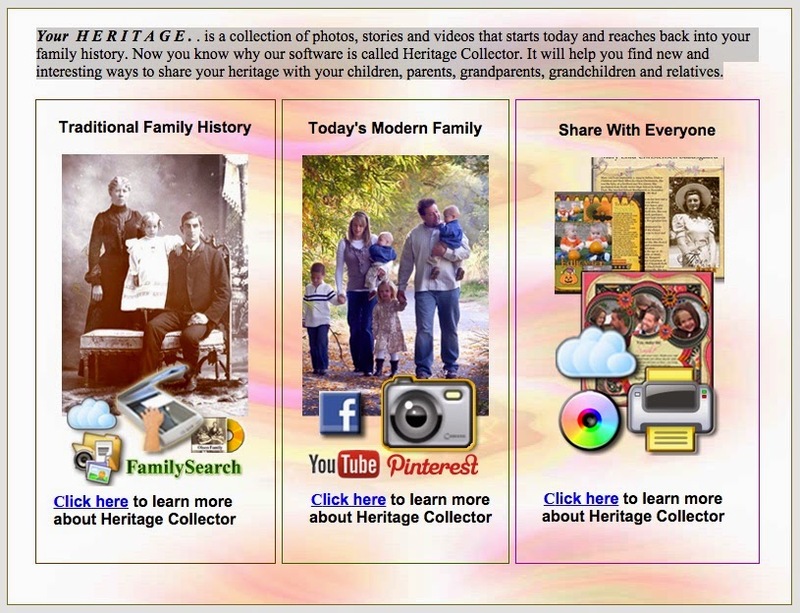 Good move RootsMagic and a terrific move for MyHeritage.com. Many of those people I know personally, including my wife, have ancestors from Scandinavian countries and particularly Sweden. Recently my wife recorded a short introduction to Swedish research. This video is hosted on the Brigham Young University YouTube.com Channel along with many other both long and short videos. This growing inventory of instructional videos is fast becoming a valuable source of basic instruction. Can I sue for plagiarism? To rephrase the question posed in the title to this post: can I maintain a separate cause of action in a court of law based on plagiarism as opposed to claims for copyright infringement? The complicating factor in answering this question in the United States, involves the issue of jurisdiction. In the U.S. Federal District Courts have original jurisdiction over copyright claims. This means that you cannot file a copyright action in a local or state court. So how do you separate a claim for plagiarism from a claim for copyright infringement? This is a recurrent issue in the larger genealogical community. The most common form of complaint comes from a genealogist who "shares" their family tree (i.e. pedigree and/or research) with another person, usually a relative, only to have the relative copy and publish the family tree in its entirety without attribution (i.e. giving credit to the "originator"). Of course this scenario raises multiple issues including a claim of plagiarism. Despite the common folklore level of belief about both plagiarism and copyright, both claims arise from a concept of ownership of ideas and concepts. The distinction between the two is extremely blurred. To begin to understand the basic distinction, it is necessary to understand the concept of a "cause of action." In the legal world, the phrase "a cause of action" refers to a legal claim that can be the basis for filing a lawsuit in s court. Learning the distinction between what is and what is not a cause of action is at the heart of one of the main skills acquired by attending law school. The complete knowledge of this skill is only learned after considerable active trial experience. Failure to "state a cause of action" when filing a lawsuit can be the basis for nearly automatic dismissal of the lawsuit. One of the most common responses in an answer to a complain filed in the court is that of "failure to state a claim upon which relief may be granted." In some instances, stating such a claim may involve reciting a long list of elements. 6. That [name of defendant]’s concealment was a substantial factor in causing [name of plaintiff]’s harm. Working backward, an attorney (or anyone filing a lawsuit alleging fraud) would have to include an allegation of each of these claims in his or her complaint or risk having the complaint dismissed for failure to state a cause of action. The reason why I mention this particular cause of action is that the concept of perpetrating a fraud lies at the heart of the concept of plagiarism. Basically, plagiarism is when a person appropriates ideas and content created by another person and claims it as his or her own work with disclosing the source of the material appropriated. However, any cause of action alleging fraud for plagiarism would lie with the recipient of the work, not the originator. Notwithstanding the existence of a potential fraud claim, plainly stated, in the legal world, there is no separate cause of action for plagiarism. Any such claim made in court must be stated in terms of some type of fraud. Further, plagiarism is usually alleged by the recipient of the plagiarized work. For example, the common context is in a school or classroom setting where the student submits a paper with material copied from another as his or her own work. In the academic world, this is very common and dealt with, sometimes, very severely, resulting in the student's failure of the assignment, or in some cases, expulsion from the school, college or university. In the context of the genealogist whose family tree is appropriated by a relative, this third-party involvement, i.e. the academic institution, is missing. Could the school maintain a cause of action against the student for plagiarism? Realize that in this instance, the creator of the plagiarized work is very, very likely totally ignorant of the unattributed copy. In fact, the copied work could even be freely available and in the public domain. In nearly all instances of plagiarism, ownership of the original, copied material is not the issue. Failure to attribute the origin of the copied material, usually in an academic setting, is the issue. Any legal involvement arising from a claim of plagiarism is commonly raised by the student challenging the actions of the academic institution. Again, the originator (writer, creator etc.) of the plagiarized work is not involved. Could the genealogist whose work was "plagiarized" maintain a cause of action? I have a difficult time imagining such a situation because, if you examine the cause of action for fraud, you will see that the action is based on a claim by the recipient of the plagiarized (or allegedly fraudulent) work, not the originator. If I looked at a family tree online that had been copied without authorization from its originator, would I have a cause of action for plagiarism? You might like to argue that you did, but no attorney in their right mind would take such a case absent some substantial proof of damage. Other than hurt feelings and indignation, how is the originator of a family tree, whose work is plagiarized damaged? Now, this is where copyright comes in. Historically, recognizing that the originators of a work had no cause of action for unauthorized copies made of their work, lawmakers made up such a claim and called it copyright protection and identified the created work as "intellectual property." The statutes conferred a type of ownership on the originators (authors, composers etc.) of a work (books, articles, compositions etc.) and gave the originators a "cause of action." The catch here was that the cause of action was severely limited by the exact words and the interpretation of those words in a court of law. We have now come full circle. if I want to maintain an action in a court for copyright infringement, I must allege a cause of action based on the copyright statutes of the jurisdiction where I bring the action. For example, in the United States, I must allege all of the elements of a copyright infringement case as established by the applicable statutes and existing court rulings in the U.S. Federal Court system. In the legal context, if the originator of a work, such as a family tree, thinks that the work has been plagiarized, they are really thinking in terms of ownership of the work and are, almost always, really subject to a copyright infringement claim. Plagiarism does not apply. Can I maintain a claim for copyright infringement if someone copies my online family tree without attribution? The answer, as far as the current case law is concerned, is maybe. But my opinion is no because there is no U.S. Federal Court case that has recognized an online family tree as a "protected work" under the existing statutes. The copyright issue arises when the work becomes "original" as defined by the statutes. For example, when the originator adds his or her own original work in the form of notes, comments, stories etc. to the family tree. If you would like to pursue this issue and argue with me about the application of the copyright law, I would be glad to respond, Please see Copyright and Genealogy from the Association of Professional Genealogists as a starting point. The extent to which any work is covered by copyright law is determined by the amount of original content created by the originator of the work. Attorneys sometimes learn by hard experience how to judge whether a claim by a client constitutes a viable cause of action. If you believe you have a claim for plagiarism and/or infringement of copyright, please seek competent legal advice from an attorney who is practicing law in the area of intellectual property. This is a narrow area of the law (i.e. may be considered to be a specialty) and many attorneys in general practice know little or nothing about intellectual property. Please remember that I am no longer a licensed attorney and I am completely retired from the practice. This post is my own personal opinion and nothing in this post should be construed to constitute legal advice on any particular set of facts or cause of action. This is yet another in the series of Brigham Young University Family History Library videos from classes. This one is from Cathy Magleby, a local genealogist. As I regularly point out, these videos are on the BYU Family History Library Channel on YouTube.com. There will be no regular Sunday classes in December, but you can check the BYU Family History Library Facebook page for information about classes that may be scheduled during the week in December. Here is another in a series of classroom videos from the Brigham Young University Family History Library. The class schedule is usually posted on the BYU FHL Facebook page. I understand that there may be no Sunday afternoon classes in December. But I may be teaching during the week so check for a posting. As I looked out my window at the first real snowfall of the season, I began to reflect on where we are in genealogy today. Yesterday I taught two classes, one on searching on Ancestry.com and another on the FamilySearch.org partnership programs. Despite the misgivings of more experienced genealogists, I find that those just beginning to have an interest in discovering their family's history are truly overwhelmed by the technology. This does not just include older genealogists who did not grow up with computers, but also younger, very educated and technologically adept people who have yet to take advantage of the flood of available information. One comment was indicative. A lady, who was much younger than I am, commented that she had started to use MyHertiage.com and was baffled, in a sense, by all the suggested tree matches and source hints. After my brief explanation of how and why the program operates, she was determined to go home and get busy looking at the sources she had been ignoring. I think one thing the technology is doing is putting us in position where we are metaphorically standing in the stream of a firehose of information and changes. This situation has many would-be genealogists stumped about where and how to begin. Once they begin to use the online programs, especially FamilySearch.org, they are confronted with a huge number of options. If you are swimming the stream of technology, you can't imagine how intimidating it is to people standing on the shore watching you speed by with the current. From findmypast.com: 953,000 new District of Columbia birth, marriage and death records,18 new US periodicals, over 95,000 new Irish Survey Maps & Plans as well as thousands of new UK School & Prison Hulk registers. From blogger, Miriam J. Robbins' blog AnceStories: The Stories of my Ancestors: Holiday Special Boot Camp: I'm Attending...Are You?. From John D. Reid on his Canada's Anglo-Celtic Connections: Relationship Chart (useful for those who don't understand relationships). From Harold Henderson's Midwestern Microhistory: A Genealogy Blog: What I learned from one year's family postcards. From the Mocavo Blog and Michael J. Leclerc's Genealogy News: State Historical Commissions Help Genealogists. From the MyHeritage Blog by Aaron: MyHeritage sponsors Polish museum’s resource center. Now, how do I tell a budding genealogist that they must spend virtually their full time just reviewing each day's offerings from the genealogy community? On a regularly busy news day, I can have well over 100 and sometimes over 200 posts to review. To keep sane, I have to invoke my personal filter that filters out almost everything and gets very picky about what I will spend my time on reviewing more in depth. RootsTech 2015 will be held on February 12–14, 2015, in partnership with the Federation of Genealogical Societies (FGS), offering two great conferences in one location at the Salt Palace Convention Center in Salt Lake City, Utah. Upgrade your RootsTech three-day pass to include the full four-day FGS program (Wed. through Sat.) for a small additional fee. Both of the simultaneous conferences will have an extensive list of presenters and classes. Some of the presentations at RootsTech will then be recorded and used as the seed presentations at hundreds of more local conferences. Even living here in Provo, Utah, only a matter of about an hour's drive from downtown Salt Lake City, I find that very, very few people are even aware of the existence of the #RootsTech conference, even those who are members of the sponsoring organization, The Church of Jesus Christ of Latter-day Saints. This is the case despite announcements of big-name entertainment stars' participation in the conference. Another interesting new trend is the genealogical cruise ship experience. My wife and I took our first cruise this past summer. We went to Alaska on the Inside Passage. It was an interesting and very impressive trip which we throughly enjoyed. Would we do it again? Would we go on another cruise to a different location? Would we consider going with a bunch of genealogists for the ostensible purpose of sitting in classes while on the cruise ship? Nevertheless, there is an almost constant stream of announcements of future cruises. One thing I can say about our cruise is that we didn't get much sleep and we ate way too much food. Given the time it took to just live on the ship, I have a hard time imagining getting a lot of genealogy done. For example, most of the dinners took from an hour or so to well over two hours. We are definitely not used to spending two hours just to eat dinner. I am sure we are in the minority judging by the number and popularity of these cruises. Fortunately, in all this rush hour traffic of genealogical events and news, we still try to focus on very local and very personal genealogical projects. I am currently in the middle of a very local oral history project and a record transcription project for a local university (not BYU). I am certainly still and always will be very busy. Fortunately, I can still sit and write and look out the window at the new coating of snow on the now leafless forest hillside next to our house. It reminds me that my world does not always have to run at high speed. I am now commenting on Chapter Eleven: An Introduction to Medieval Research by John M. Kitzmiller, II, AG, FSA(Scot), FSH(Eng). Moynihan, Cornelius J. Introduction to the Law of Real Property: An Historical Background of the Common Law of Real Property and Its Modern Application. St. Paul, Minn: West Pub. Co, 1962. Of all the law books I used in school, this is the only one I still refer to. Reading the chapter by John Kitzmiller immediately made me think of this book. The brief introduction to Medieval Research in this chapter belies the riches in the Moynihan book. This class had all of the students, including me, running to Black's Law Dictionary (Garner, Bryan A., and Henry Campbell Black. Black's Law Dictionary. St. Paul, Minn: West Group, 1999). almost after every class. One key to doing research in Medieval times is understanding land tenures. As pointed out by Kitzmiller, the Middle Ages are usually divided into three periods; the Early Middle Ages from the Fifth to the Tenth Centuries, the High Middle Ages from the Eleventh to the Thirteenth Centuries, and the Late Middle Ages up to the Fifteenth Century. You might remember that the year designations are 100 years behind the Century designations, so the time period is from the 400s to the 1400s, just about a thousand years. The records and forms of land ownership and use changed over that extended period of time. A thorough understanding of the modern land law is impossible without a knowledge of it historical background. Moynihan further quotes a statement made by Mr. Justice Holmes, who said, "Upon this point a page of history is worth a volume of logic. See New York Trust Co. v. Elsner, 256 U.S. 345 at 349, 41 S.Ct. 506 at 507, 65 L.Ed. 963 at 983 (1921). These statements not only apply to lawyers and their litigating parties, but equally apply to those using land law and the records created by the law in any given time period for genealogical research. Be careful in using early, published genealogies and histories, which have a tendency to be inaccurate when it come to a connection to the landed gentry. I would strongly second that opinion. As I have written several times before, pedigrees showing royalty are usually just copied and as indicated, usually from a very unreliable source. I certainly admire the person who can do original research in the Middle Ages, but I would hope that the rest of us would recognize the difficulty and not be so quick to extend our pedigrees through mere copying. I hate to tell you this, but these are really common terms and really do matter for an understanding of the Middle Ages for genealogical research. Kitzmiller gives a very abbreviated discussion of most of these terms in his short article. Over the past decade, online family history research has grown in the United States by 14 times, with two-thirds (63%) of respondents in a recent study reporting that family history has become more important than ever. They also say that this growth is motivated by a belief that knowing more about the past is a key part of understanding who we are. Announced today by Ancestry.com, the world's largest online family history resource, the new findings are part of the first chapter in its Global Family History Report, a multi-country study that examined trends in the family—both past and present—across six developed countries: the U.S., UK, Canada, Australia, Germany and Sweden. The study by the Future Foundation on behalf of Ancestry.com examined trends in the family—both past and present—across six developed countries: the United States, UK, Canada, Australia, Germany and Sweden. Nearly three-quarters (72 percent) of respondents reported feeling closer to older relatives, with half of older relatives saying they had drawn closer to young relatives as a result of learning more about their family. Younger people (55 percent overall) are among those inspired most to learn more about their family history by talking with older family members. The average family history for US respondents stretches back 184 years, compared to 149 years a generation ago. Among Americans who’ve gone beyond talking to family to research their family history, three of the most commonly used resources are photographs (81 percent); birth, marriage and death records (66 percent); and letters (45 percent). I am always skeptical of vaguely cited statistics, particularly those that try to prove the "popularity" of genealogy and/or family history. There is always a tendency to translate a vague interest in families into support for the popularity of doing genealogical research. The problem here is separating the overall growth and impact of the Internet on the world's population from a specific interest in genealogy or family history. One example is the Internet Growth Statistics from the Internet World Stats website. From the statistics cited on that website, in February of 2004 (ten years or a decade ago) there were approximately 745 million Internet users worldwide. By March of 2014, the estimated number of users had risen to 2,937,000.000 users. In other words, the percentage of Internet users in the world population rose from 11.5% in 2004 to 40.9% in 2014. Now the problem is this; how do you compare a statistic that claims a "14 times" growth with the percentage increase in overall Internet usage? Finding exact statistics from Ancestry.com about the number of users and growth is pretty difficult. Isn't it true that people feel more connected today than they did ten years ago? I can now talk instantly or nearly instantly to my children around the country (an around the world if need be) in a variety of ways, all of which are essentially free results of Internet connections. Doesn't this alone support the cited rise in interest? I am certain that involvement of people in online programs such as Ancestry.com, MyHeritage.com, FamilySearch.org and all the other online genealogy programs, has increased awareness and interest in families. We do have current numbers of users from MyHeritage.com. They have a counter on their website showing the number of members of the program. Today, the counter showed 73,293,269 members of MyHeritage.com worldwide. I have observed that in the past few weeks, that number has been increasing by about 100,000 new members a week! Simple math shows that about 2.5% of the world's estimated Internet users are on MyHeritage.com. All in all, these statistics are interesting and perhaps even encouraging. But they would be more interesting if they could be compared to some actual historical numbers. Do you have a source for every conclusion in your family file? Traditional genealogy began with a pedigree chart and a search for names. From my experience nearly all beginning researchers start out the same way. They begin filling in names and they follow the suggestions from countless books, classes and websites that teach the Research Cycle. For a more complete explanation, see the Principles of Family History Research in the FamilySearch.org Research Wiki. Of course, it would be heresy to either question this time honored method of approaching genealogy or even to dare suggest that the approach was outmoded and even misleading. But that is exactly what I am going to do. Times and methods change. It is past due time to revise this traditional approach and realize that it is no longer necessary. I have been advocating a change for many years now, however, I have no expectation that the paradigm will change during my lifetime, even though the tools and procedures have been available for many years. In 2013, 83.8 percent of U.S. households reported computer ownership, with 78.5 percent of all households having a desktop or laptop computer, and 63.6 percent having a handheld computer. In 2013, 74.4 percent of all households reported Internet use, with 73.4 percent reporting a high speed connection. I might also point out that a significant portion of the rest of the population has free access to computers at libraries and other providers across the nation. Let's construct a hypothetical beginning research situation. Doe is a new researcher. For a variety of reasons, he has become interested in his ancestry. What is the best and most efficient way for Doe to get started? The old method would have Doe searching for records in his home and filling our a paper Family Group Record or Pedigree Chart. He would then move on to asking relatives for records, slowly filling in his chart and accumulating a pile of records. What has changed? Today, Doe can go onto any one of several online database websites and begin by filling out his name and his parents' names on a pre-constructed family history form. He could use Ancestry.com, MyHeritage.com, findmypast.com, Geni.com, FamilySearch.org or other programs. Now, before I go much further with this hypothetical, I need to make some assumptions. Some of these programs are subscription services. You could argue that the "traditional" method of starting genealogy was "free." Well, access to all of these programs is already available to over 70% of the U.S. population (actually higher in some countries). I am going to assume that Doe can either afford the nominal cost of subscribing to one or more of these programs or that he can use a computer in FamilySearch Family History Center and gain access for free to some or all of them. Now how does Doe begin his research? He doesn't. 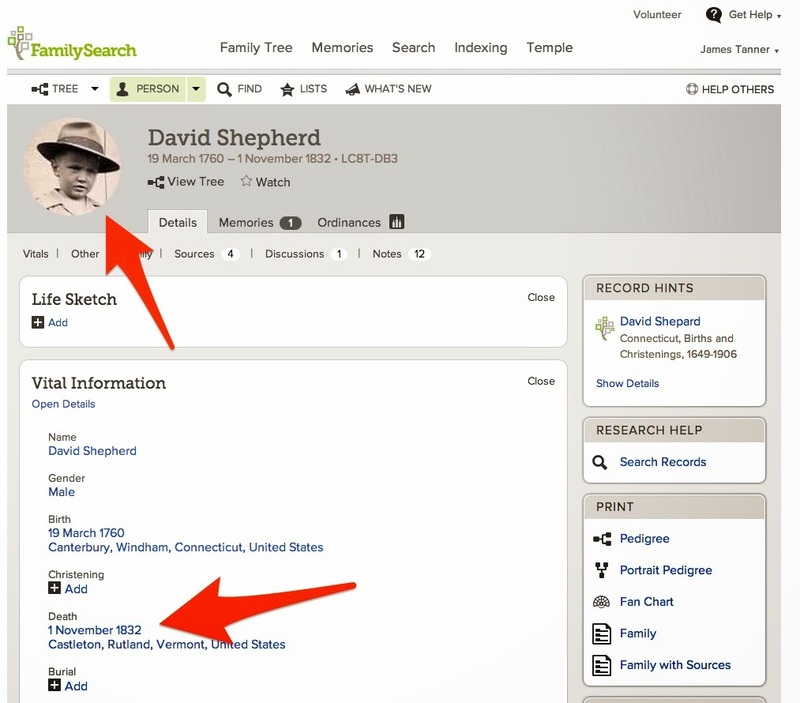 If he is using either MyHeritage.com or Ancestry.com or FamilySearch.org, all he has to do is enter a minimal amount of information about himself and his parents and perhaps a name or two of grandparents. The programs then begin to suggest sources for further information. Guess what? What is more this process of finding sources is cumulative. The more Doe adds to his growing family tree from sources supplied by the programs, the more sources the programs find. I have seen people build a four generation pedigree in a matter of hours, all based on sources. The results of this new paradigm are not hypothetical. During the past two or three years, I have sat with dozens, perhaps hundreds, of researchers and have gone through this scenario, adding only a few names and then letting the programs build a pedigree from scratch based on sources, not on hearsay from their families. In many cases, I have seen those same sources correct information that the researcher "knew" to be true. This has had a rather dramatic impact on people, especially when they find out for the first time that they were adopted or that their parents were not married when they were born. I have to say that many people have to see this happen on the computer screen before they believe it is possible. 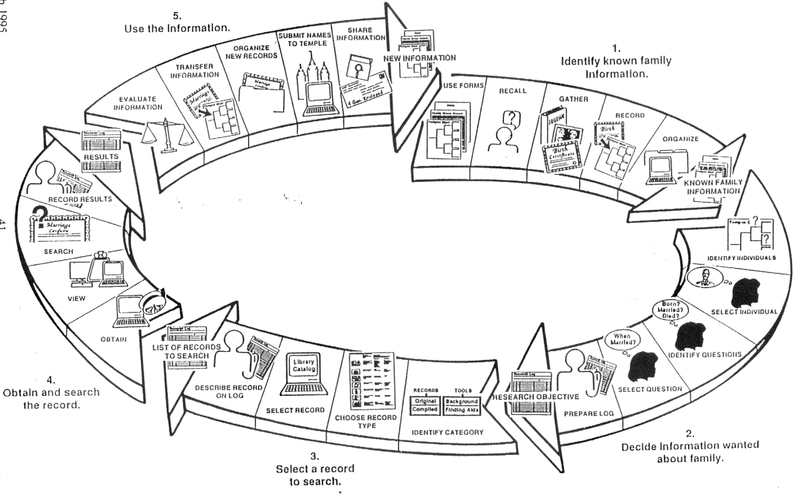 Many researchers want to "cheat" the system and upload a GEDCOM file or start with entering all of their own research. In these cases, the person has to be willing to change any information they may already have in favor of what is supplied by sources. By the way, I have heard dozens of arguments from researchers as to why this doesn't work. These criticisms come mainly from people who have no idea how or why these programs work. The ones who try this out with a fresh, newly added family tree, find out that it does work. The system is not perfect. The researcher still needs to carefully review each suggested source to make sure the program has found the right person, but usually, at least in the first 200 years or so, this is not a problem. As I just mentioned, I have been hearing the excuses and criticism of this method of building a pedigree for years now. In order for this to work, the person who is doing the research for the first time needs to be patient. Sometimes it is necessary to prime the pump so to speak and add a little bit more information to the online family tree before the programs begin to supply information, but so far, I have not had anyone who did not get assistance in building a sourced family tree. I will undoubtedly get comments from users of all three programs who will tell me their disappointed reactions from their own database. Usually, this comes from people who expect to have the programs supply ancestors back in the 1700s or even the 1600s. This is not going to happen yet. I also hear criticism from those who want to ignore the more recent in time sources and jump back to a remote ancestor. You have to build the pedigree step-by-step and use the sources. Each time you confirm a source, you are providing more information to the program and so it can be more accurate. Take your time. Use the sources provided. What will happen if you do upload a huge genealogical database file? In each of the three programs, you will get more suggested hints than you can handle. For example, today I have over 8000 suggested sources from MyHeritage.com. Let's start using these newly developed programs as they were intended to be used and stop trying to fight against the change in methodology. Some issues just keep making the rounds. I can't even begin to imagine how inexperienced genealogical researchers can know so little about sources and repositories and yet can repeat, verbatim, every one of the genealogical myths. Of course, I have written about this subject before, but since during the past couple of weeks I have heard a reference to a good handful of myths, so I decided it was time to fire up the jets and take on the issues one more time. Why do people believe myths? Why is it so much easier to believe something such as the three brothers story, than it is to examine the historical facts from reliable sources and determine a more probable course of events? I'm not talking about the complex belief systems such as Greek Mythology, but the just the ordinary false ideas that seem to get passed around as facts. Genealogy is not at all unique in this regard. I would guess that every human activity has its core of myths. It is just amazing to me how the genealogical ones seems to persevere despite the lack of any rational support. I guess a stranger question is why don't I believe the genealogical myths? No one had to tell me that the descent from an Indian Princess was a myth. But is is true that some myths are so persistent because they either have or once had a basis in fact. Take the burnt courthouse story for example. It is a historical fact that courthouses do burn down. What is not necessarily true is the conclusion drawn from that fact. Not every courthouse fire occasioned the loss of every record in the county and some of the destroyed records had to be reconstructed as rapidly as possible after the fire. What is frustrating is when a researcher substitutes the myth for the reality and uses the myth as an excuse to stop searching. What is even worse than that is when the myth is accepted as reality without a shred of evidence to support that conclusion. Some myths are not universal. Every family seems to have a story or tradition that defies verification. Some of these stories when proved inaccurate or even false, defy refutation. They persist in face of overwhelming evidence that the claimed event or document is not accurate. I have such a myth in my own family involving a photographs of a remote ancestors. 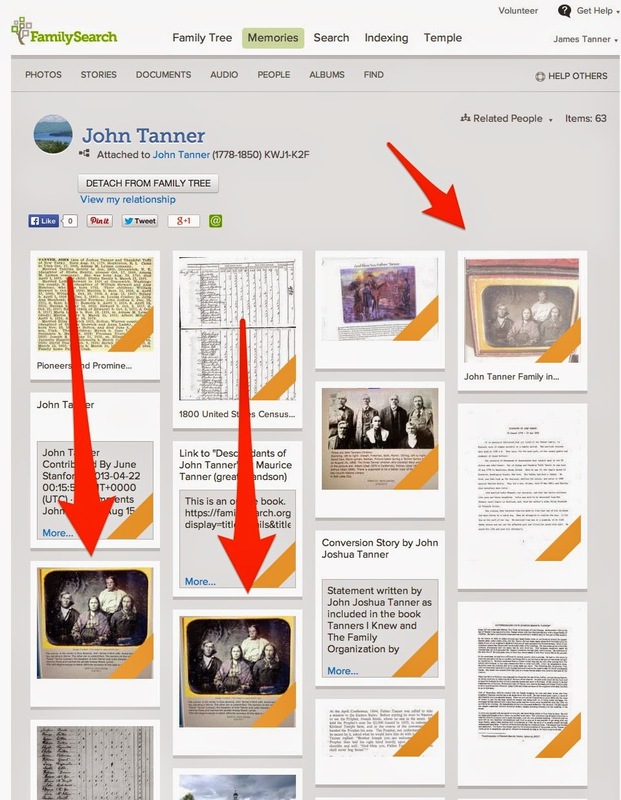 This image shows the Memories page for John Tanner (b. 1788, d. 1850) in the FamilySearch.org Family Tree. The arrows show three identical copies of a daguerreotype purportedly showing John Tanner seated on the far left. My daughter Amy and I examined this photo and reported our findings in an extensive analysis published on TheAncestorFiles Blog. By the way, there are five more copies of the same photo attached to the same Memories page in FamilySearch.org's Family Tree. The analysis boils down to historical facts but the myth persists. Here are a few historical facts about the daguerrotype process and the life of John Tanner. 1778: John Tanner born in Hopkinton, Washington, Rhode Island. 1837: Louis Daguerre invents the Daguerreotype process in France. At this time John Tanner is 59 years old. 1839: John Tanner and family reach Illinois after being driven from Missouri. 1841: Albert Sand Southworth opens the first daguerreotype studio in Boston, Massachusetts. John Tanner is now 63 years old. 1841: The Tanners are living in Montrose, Iowa across the river from Nauvoo, Illinois. 1844: John Tanner is called on a mission for the Church to the Eastern States. 1845: John Tanner returns to Nauvoo. He is now 67 years old. 1846: John Tanner and his family begin the Exodus from Nauvoo, ultimately to the Salt Lake Valley where he dies in 1850. So the real questions are when did daguerreotype studios open in Western Illinois and more importantly, is the man in the proposed daguerreotype about 65 to 67 years old? Here is a link to our conclusions concerning this issue: The Tanner Family Daguerreotype: Conclusion. Notwithstanding our conclusions, the daguerreotype will continue to proliferate as a photo of John Tanner. Now to the second photo. This is another photograph attached to David Shepherd (b. 1760, d. 1832). This is even more interesting since the supposed subject of the photo died almost seven years before photography was invented and the photo is of a child. Myths are basically irrational, emotional and almost impossible to disprove or eradicate. Good luck if you have one in your family. You might as well enjoy the story and ignore the facts.